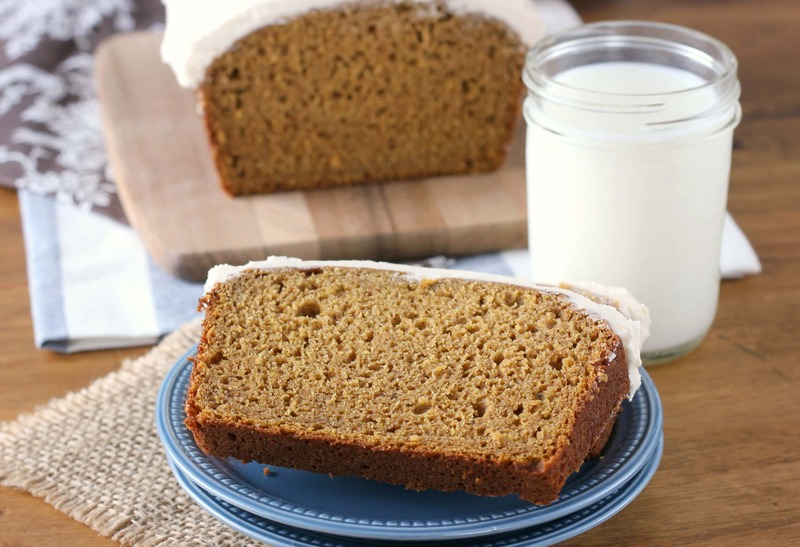 This Pumpkin Bread is filled with lots of pumpkin puree and pumpkin pie spices! A fluffy, sweet maple buttercream tops it off making it hard to eat just one slice! I mentioned last week that the pumpkin recipes have started at our house. I’m afraid they’re not stopping any time soon! Between pumpkin and apples, it’s safe to say that fall recipes have officially taken over our kitchen! 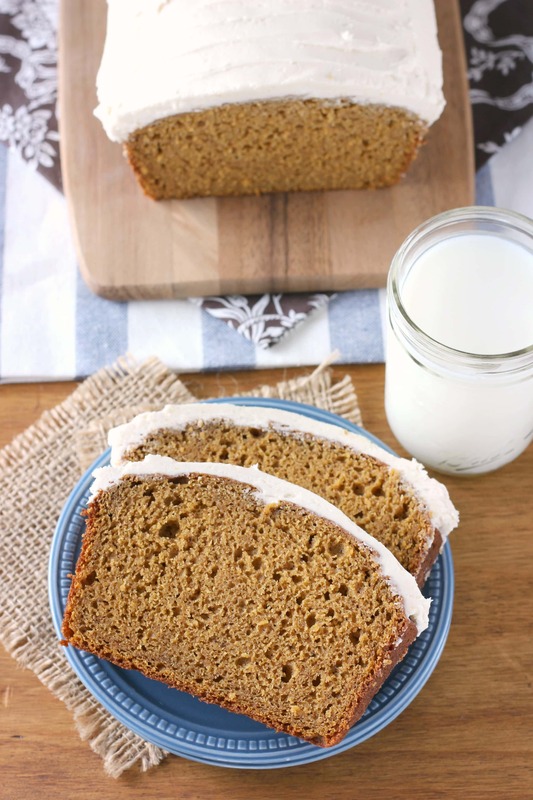 One of my favorite things to make this time of year is a pumpkin quick bread. 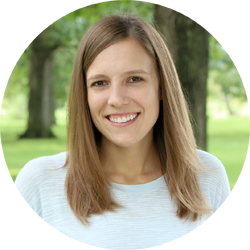 It’s so easy to make and there are lots of ways to change things up. 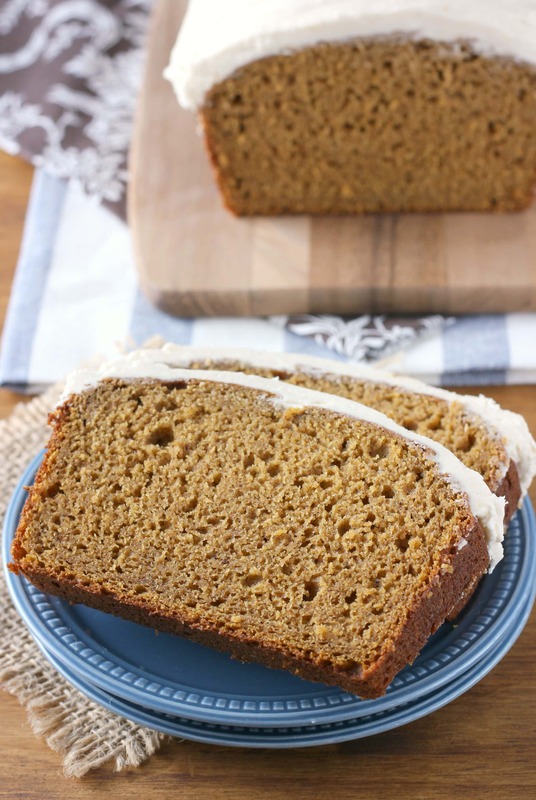 Like this pumpkin bread with maple buttercream! Just like these pumpkin coffee cake muffins, this pumpkin bread has maple syrup and extract throughout the bread and the topping! I started with this combination at the end of last fall, and my love for it is still going strong this fall! The bread itself is relatively healthy made with a mix of regular and whole wheat flour. Yogurt makes up for the fat and the pumpkin provides moisture, so the bread stays fresh longer. The frosting, on the other hand, isn’t so healthy. If you really want to, you could leave off the frosting, but it adds a creamy sweetness that pairs perfectly with the warm spices of the bread! Cut a thick slice and enjoy with a large glass of milk or mug of hot coffee. You’ll find that it’ll be your new favorite way to start your day! In a large bowl, whisk together flours, baking powder, baking soda, salt, cinnamon, nutmeg, allspice, and cloves. Set aside. In the bowl of a stand mixer (or with an electric mixer), beat together brown sugar, sugar, and eggs until creamy. Beat in yogurt, oil, vanilla extract, and maple extract until well-combined. Beat in pumpkin until just combined. Slowly add in flour mixture and beat until just combined, scraping down the sides of the bowl as necessary. Spread batter into prepared loaf pan. Bake for 50-55 minutes or until toothpick inserted in the center comes out clean. Remove from oven and allow bread to cool in pan for 10 minutes before removing to a wire rack to cool completely. While bread is cooling, prepare frosting. Beat together butter and confectioner's sugar. Add in maple syrup and maple extract. Beat until creamy. Spread frosting over cooled bread. This bread is just gorgeous, Jessica! I’m hooked on pumpkin anything, so they’re not stopping anytime either in my kitchen. Love that maple buttercream! Keep the pumpkin recipes coming! 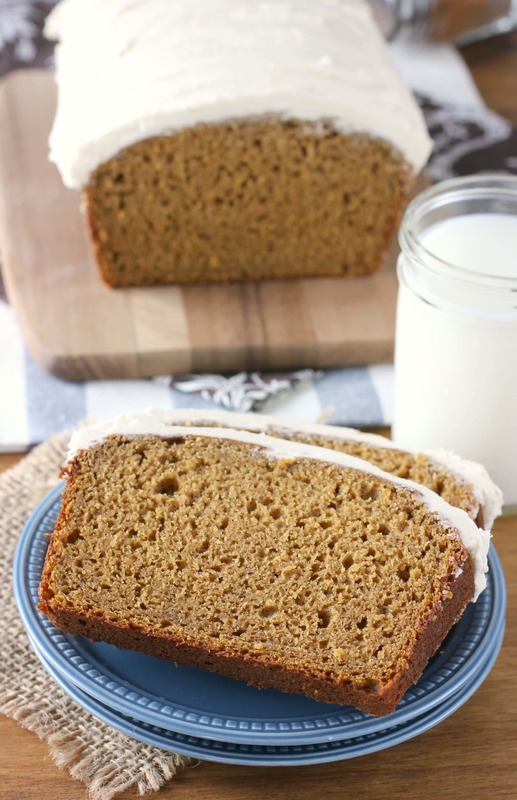 Love that this has maple syrup in it – such a delightful loaf! What a gorgeous pumpkin bread! I love that pumpkin and maple combo! Frosting is not optional around here!! !